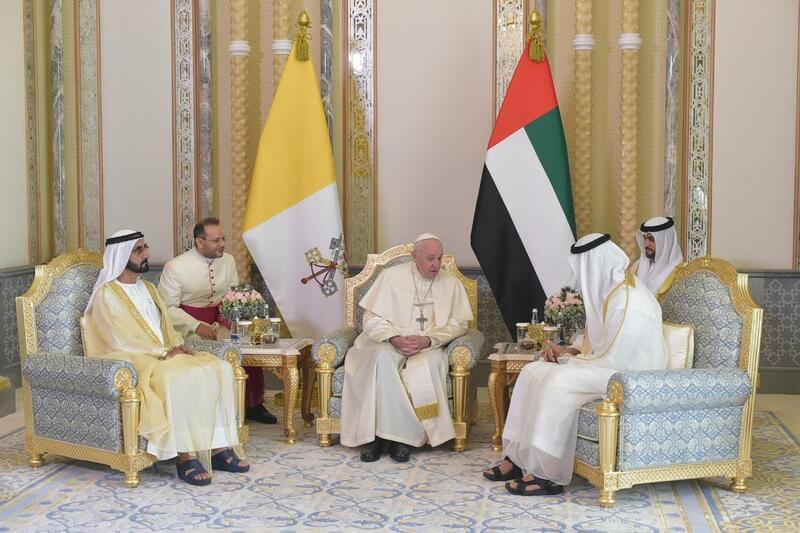 Pope Francis was given a spectacular reception on his first day in the United Arab Emirates. In this historic visit as the 1st Pope visiting an Arabic peninsula; Pope Francis was welcomed by the Crown Prince who had acrobatic pilots of a special air team perform aerial acrobatics above the bay. They had trails of yellow and white smoke in honour of the Vatican colours. Pope Francis greeted the Crown Prince Mohammed bin Zayed Al Nahyan and the band played the Vatican hymn. Both the pope and Crown Prince entered the palace for a private meeting. The Crown Prince presented a gift to the pope. The legal agreement that permitted Catholics to construct their first church in the country from June 1963. Pope Francis also presented this gift to the Crown Prince; a a medal with St. Francis of Assisi meeting the Sultan Al-Kamil in 1219. The Pope wrote in the country's book of honor. He thanked them for the welcome; and sent his blessing to the whole country to live in peace and solidarity. The papal motorcade was accompanied by over a dozen horsemen on beautiful Arab stallions. The Presidential Palace grounds cover an area of 150 hectares. The Arabian-style white palace has over 70 mosaic, glass, and golden domes. Pope Francis brings a message of love and solidarity for those in need.